Whether you take the side of the living or the undead, we have a weapon for you at Zombies Playground. We carry an assortment of zombie, tactical, and survival weapons here for different purposes. We carry real, functional weapons of all sorts, like axes and hatchets, knives and daggers, machetes, swords, and more. These are well suited for using in combat, self-defense, or wilderness survival. We also have zombie and modern LARP weapons for post-apocalyptic LARP, or live action roleplay, events. You can also shop Zombies Playground for plastic weapons that are perfect for prop and costume use. We have everything from prop swords and butcher knives to prop chainsaws that will bring a touch of terror to any outfit without the danger of a real weapon. No matter the kind of weapon you are searching for, be sure to take a look through all we have to offer here at Zombies Playground. Here at Zombies Playground, we pride ourselves on providing the widest assortment of weapons possible, all so that you can be totally prepared for any level of zombie attack. If you are practicing for a zombie attack or putting together your own zombie games, then real weapon and plastic weapons are unsuitable. What you will want are some of our great LARP weapons! LARP stands for live action role play and is best defined as a group of like-minded individuals getting together to play out a fantasy or fictional scene that generally involves combat of some sort. It comes in various styles or flavors, ranging from medieval and pure fantasy to modern and post-apocalyptic. Here, we cater more towards those with a more modern flare and beyond, as these are some of the most common settings were one will find zombies. What sets our LARP weapons apart from our other weapons is that unlike our plastic weapons, our LARP weapons are made to such standards that can readily be used in combat-like situations. This means you can battle without fearing that the weapon will shred or break in your hands, as well as the comfort in knowing that the weapon is soft enough to use on others without potentially hurting them! All of our LARP weapons are approved for use and are made from an amalgam of materials, although the most common combination is heavy duty foam, silicone skin, and a fiberglass core. 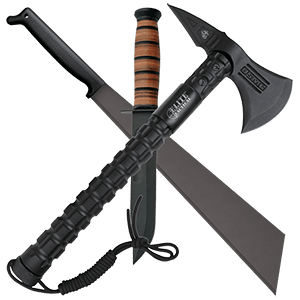 Here we offer a few different categories of weapons and tools, to best help you find the zombie LARP gear for you! 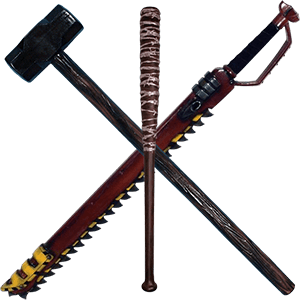 Within, you will find all manner of weapons, ranging from conventional arms like knives, swords, and spears that are obviously made for battle, as well as improvised weapons that depict things like sledge hammers and wrenches, tools that were once for mundane tasks but have proven to be quite effective for use against a zombified foe! We also offer a few defensive tools too, to help keep you safe in a zombie LARP! So if you are looking for something to train with or something to use in your next simulated battle against the undead, you will want to check out our LARP Weapons, because you are bound to find the ideal weapon right here at Zombies Playground. Unless you know that you're going to be facing and attacking real zombies, any time you stage a zombie outbreak, it's probably best to consider using the Plastic Weapons from the Zombies Playground. What they lack in working blades and parts, they more than make up for with incredibly detailed appearances. Being much safer than real weapons, you aren't likely to run into many accidental injuries (much less, heaven forbid, accidental fatalities) whenever all your human survivors and undead zombies are wielding plastic weapons. These plastic weapons can be put to a wide assortment of different uses, serving best as props for costumes, productions, and other events where their appearance can and will be admired, while their performance as a working weapon will remain untested. 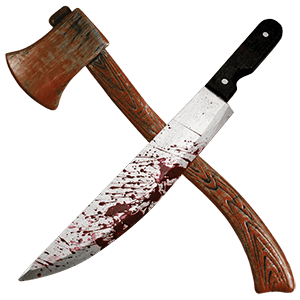 You'll find a variety of different weapons in this category, ranging from proven zombie killers like axes, machetes, and knives, to other mundane tools like farm implements, all the day down to more impressive and visceral weapons like chainsaws. As many of these weapons are made from molded plastic or other stiff, hard materials, they are designed to look great but lack the strength to function as a working weapon. That's just as well, though, because many of these Plastic weapons just as great in the hands of flesh-hungry zombies as they do in the hands of still-living survivors, and a working weapon in the hands of a zombie is any living human's worst nightmare.